Yep, the 1960s monster kids are gettin’ on in years. (If I was pushing 60 any harder, I’d have to buy it breakfast in the morning.) It’s something the four-episode miniseries “Monstrkyd Manor” addresses with gentle humor and tons of “in” references. Co-created by Linda Wylie and Frank Dietz, the series emerges as a kind of tribute to Bob Burns, one of the movement’s most ardent, generous champions, and his wife Kathy, Bob’s trusted enabler who appeared with him on early ’60s San Antonio TV in monster-themed programming. 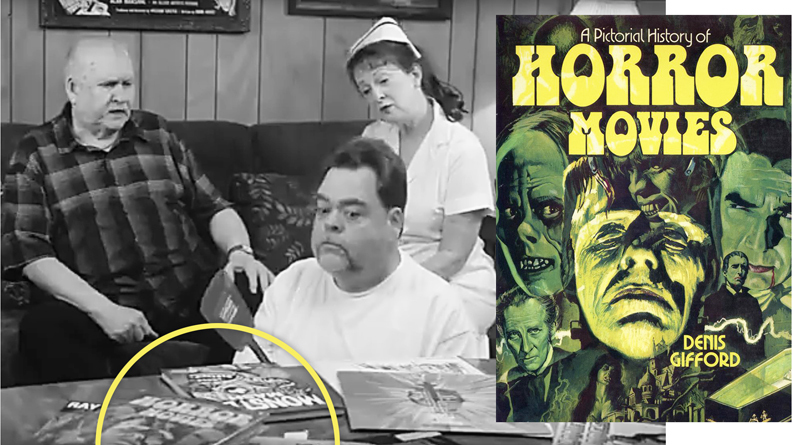 The intrinsically black-and-white “Monstrkyd Manor” is set in a home for aging monster kids, where patrons play Monster Old Maid, and framed posters of “Dracula,” “Frankenstein,” “House on Haunted Hill” and “The Screaming Skull” hang in the lounge. Wylie (who wrote three of the four episodes) plays the manor’s simple-minded nurse; Burns plays its “star” resident. Burns, Donnie Waddell and Wylie have a tense discussion in the Monstrkyd Manor lounge. I’m honored that “Monster Mash” is a staple on the coffee table in the manor. But what really flips me out is that it’s seen alongside a book I’ve loved since I was a schoolboy: “A Pictorial History of Horror Movies” by Denis Gifford (1973). I was obsessed with this book as a kid. Still am. Wylie rouses Burns in this “Monstrkyd Manor” scene. 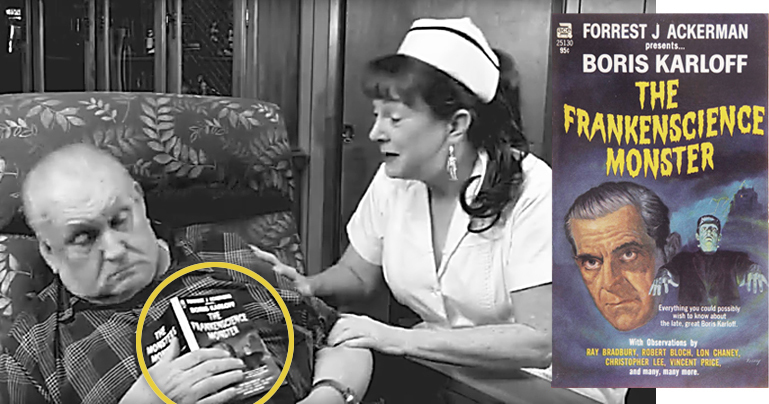 Note that Burns is clutching a copy of “Boris Karloff: The Frankenscience Monster,” the 1969 paperback edited by Forrest J Ackerman. It’s another book I studied front-to-back as a kid. I still have my dog-eared original copy, which I treat like the Scroll of Toth. Knowing Bob, it’s not unlikely that he has, in his time, dozed off while reading “Frankenscience.” The book’s presence in the episode is yet another heartwarming “in” joke. 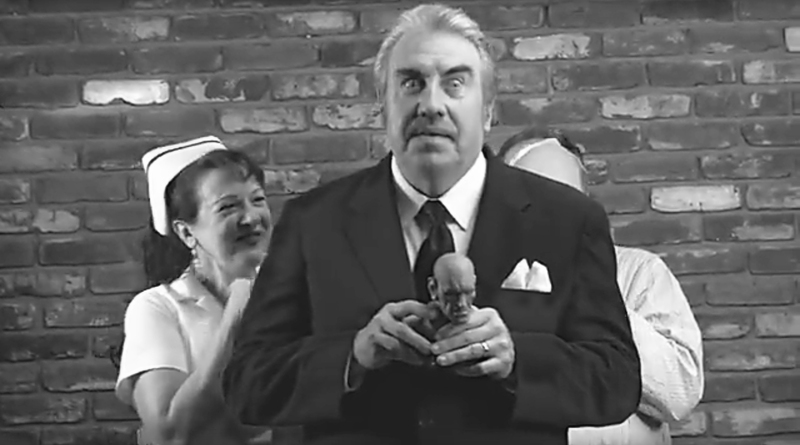 In this “Monstrkyd Manor” scene, John Goodwin (center) believes he is Vincent Price accepting a Rondo Award. I gotta say, Goodwin’s Price impression is … priceless. We horror nerds love our Vincent, even as we admit he was a master practitioner of scenery-chewing and self-burlesque. (This is why Price was at ease in comedies as well as horror films.) Goodwin taps into that weird affectation Price put on when he “played” himself on episodic television — the way he might say “I am Vincent Price,” followed by a fey, close-mouthed chuckle. I could watch this guy do Price for hours. 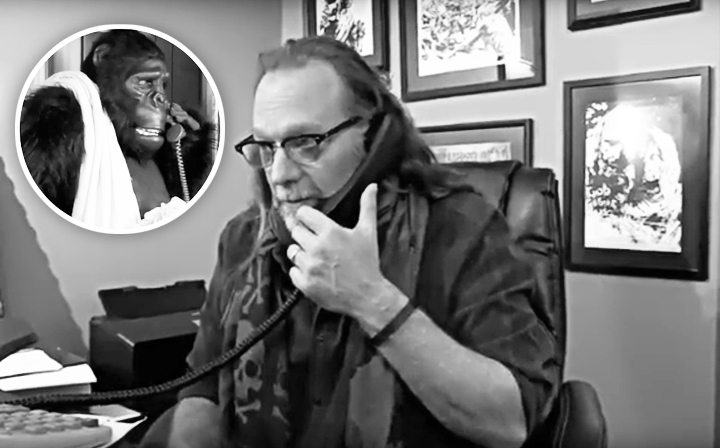 “Walking Dead” maestro Greg Nicotero cameos as himself talking, unknowingly, to a gorilla (Jeff Carlson). Nicotero does the zombie makeups for, and has directed episodes of, “The Walking Dead.” As grisly and modern as “TWD” is, Nicotero is a monster traditionalist at heart. Carlson is following in the footsteps (paw prints?) of Burns, who has a long filmography playing gorillas in movies and episodic television. Kudos to all, who joined forces to capture a “Let’s put on a show” spirit. Waddell does several deep-cut impressions, including Bela Lugosi as Bela the Gypsy from “The Wolf Man,” and Ackerman recalling his cameo as Dr. Beaumont in 1971’s “Dracula vs. Frankenstein” (an anecdote FJA recounted, virtually word-for-word, for decades thereafter). In Dana Gould‘s brief, book-ending scenes as a financier intent on shutting down Monstrkyd Manor, he speaks in an appropriately smarmy dialect and packs in winking references to such character conventions from old-timey movies and TV. Conan O’Brien has hosted Gould in his capacity as a standup comedian.